Why is finding balance so challenging sometimes? We’ve been cooped up for months. Long nights. Cold days. Hibernating, watching Netflix, drinking and eating more. We’re stir crazy. And beneath it all, there’s this feeling of new beginnings. The equinox is today, and it is coupled with a rare full moon to boot. We are marking the beginning of a new season. Metaphorically speaking, we can use this time to launch into creative mode. Springtime is for planting our seeds; what do you want to plant right now? What do you wish to harvest later this year? What are you bringing into your life, into focus, into the flesh? The equinox is the balance point. No matter where you are on the planet, it signifies the point where the light and the dark are equal match to each other. The dark is where we go to dream, to plan, and to prepare. Similarly, the light is where we go for action. To make good on those dreams and plans. I’ve got so many passion projects on my winter dream list. When I sit quietly with myself, I feel them stirring inside me. This stirring wants to compound, to become more than a healthy drive that propels me. It wants to take over. More than anything, I crave balance. Balance between planning and creating, between thinking and being, between my old habits of pushing hard and my new habits of letting things happen organically. I’m betting you’re a lot like me. You’re a doer, a mover and a shaker, you make stuff happen. And like me, you can flirt with burnout when your passion is too much for your physical body to keep up with. Balance isn’t always physically possible, though, is it? There are times we must push, and times we must pull, and times we must rest in the middle. So how do we go-getters go about creating from a balanced perspective? It all comes down to paying attention to our inner direction, and the signals our body is sending us. Like the stirring I mentioned above. I know this feeling to be a cocktail of excitement and creativity, with a jigger of not-good-enoughness. The shame of feeling like an imposter, or the fear of being found out that I’m no good or less than has fueled more creative endeavors than I care to admit. 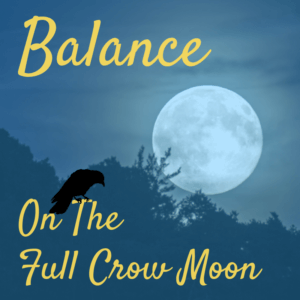 So when this Full Crow Moon sits on the Spring Equinox, and I feel that old familiar pulling and stirring, I slow down. I place my hands over my solar plexus and I take a deep breath. I remind myself that there is plenty of time. I’ll be able to get done everything that needs to get done, and probably a lot more. I create internal balance with my breath. With practice, I speak to myself with kindness. What results is self-compassion. And maybe tonight I’ll howl just a little, shake a tail feather, and welcome the light. How do YOU find internal balance? Please share. I’d love to hear from you. Is Your Story Is Out To Get You? Change Your Story! Is Your Passion Project Collecting Dust?